Classification of soils according to Robertson (1986 or 2010) allows to specify soil behavior type (SBT) and other parameters directly from the results of CPT - then input parameters of soils it's not necessary to input. We recommend to check generated soil parameters before the calculation. In the frame "Soil classification" is selected test for classification (defined in the "CPT" frame). Classification of soils is performed according to Robertson (1986 or 2010). This frame serves to input penetrometer net area ratio α [-]. The unit weight of soil γ is possible to input with the same value for all layers of soils or it's calculated automatically from the results of CPT (for each layer separately). The frame serves to input a minimum thickness of the layer of soil h. It affects the distribution and number of individual layers of soil in the geological profile of solved task. 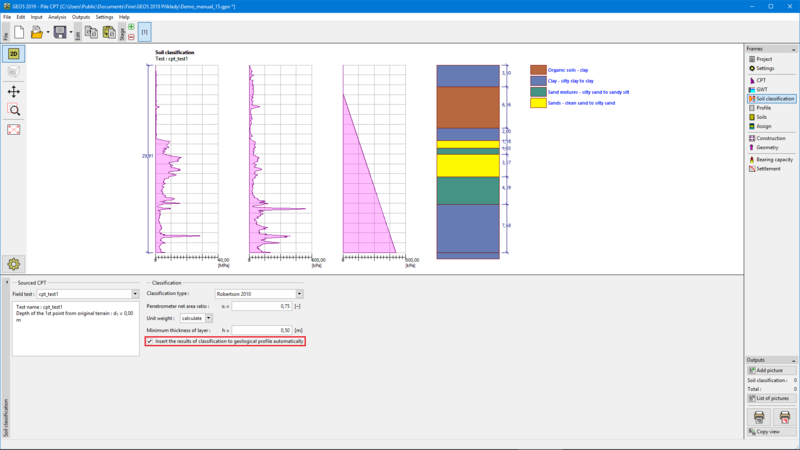 By checking the option "Insert the results of classification into a geological profile automatically" assigns generated geological profile to the current task automatically (when user change any data in the frame). During deactivation of previous option the manual assign of soil is performed by pressing the "Insert profile and soils" button.